This article submitted by Erin Aagesen on 6/14/00. As of last Wednesday, consumers have had to pay extra at the pump. Prices jumped from about $1.47 to $1.67 a gallon in Paynesville for regular unleaded gasoline in one day. Thursday's average price hit $1.69 across the nation, according to the Minneapolis Star Tribune. "The price of crude oil is going up," said Dave Lang, manager of H&L Express. "We are just passing the increases on. It's all we can do to stay in business." 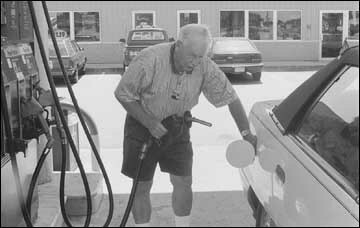 Leland Juhl of New London recently filled his gas tank in Paynesville. While driving home from Florida, he found prices higher in other states. "We have no idea what the price will be from week to week," said Jim Guenther, owner of Jim's Standard. He buys a load of gas a couple of times a week at fluctuating prices. "We have a low profit margin," said his wife, Ellen, "so we have no choice but to add to the pump price when the price increases for us if we don't want to lose money." According to Jim, when the price for an oil barrel was $35 earlier this year, he was able to sell gas at $1.30 a gallon. Since then, the barrel price has actually dropped to $30 a barrel. Still, his prices haven't improved, and neither have the consumer prices. "Somebody is making a lot of money, and it isn't us little guys," said Ellen. Jim added, "I've heard talk that the price could be up to $2 (per gallon), but it's all speculation. The cost changes on a daily basis." Leland Juhl is a resident of New London who also owns a home in Florida. He recently drove from Florida to Minnesota. "It looks bad here," he said last week, referring to local prices, "but it's not as bad as it was in other places, like Chicago. And I think I paid as high as $1.89 in Wisconsin." Though Minnesota prices are generally a few cents lower per gallon than the national average, the recent increases set gas prices at a much higher rate than they had been even earlier this spring when the frenzy over the issue began. Nationally, according to the American Automobile Association (AAA), the average price per gallon for regular self-serve gasoline was $1.29 in January, $1.54 in March, $1.45 in April, and $1.36 in May. At their present rates, prices will be up considerably for June. The Organization of Petroleum Exporting Countries (OPEC) will meet in Vienna on June 21 to discuss oil prices, but they aren't expected to put more crude oil on the market, Dawn Duffy, spokeswoman for the AAA in Minneapolis, told the Star Tribune. Crude oil is refined into various products, including gasoline. Duffy also noted that OPEC cut their production by four million barrels a day in March of 1999. While they put an additional 1.5 million barrels on the market each day this March, supply is still down. This leaves the demand for gasoline at a higher level than can be met. In March, the AAA set some fuel saving guidelines in response to the escalating prices. This was only the fifth time in its 98-year history that it has done so. "The Gas Watcher's Guide" is a 12-page brochure which outlines tips to decrease gas usage. It advocates the use of discretion when making decisions as to what type of vehicle to drive and what type of trips are necessary. Other suggestions in the brochure include maintaining steady speeds when driving, keeping vehicles in good condition, and consulting the owner's manual to ensure the proper grade of gasoline is being used. Even with careful conservation, the future of gas prices is still up in the air. Ann Schramel, manager of the Cenex station, said, "It's a puzzle to everybody. The definite indication is that gas prices are not going to be going down."